We thought Junetics’ E24 Complex Skincare System by Concoria might be perfect idea for mother's day. Hopefully you realize that mother's day is coming soon. Junetics E24 Complex works as part of a 24-hour pure energy system that enhances the skin’s own ability to repair and refine, working progressively for more youthful, radiant skin. Junetics E24 products are backed by a 100% satisfaction guarantee. 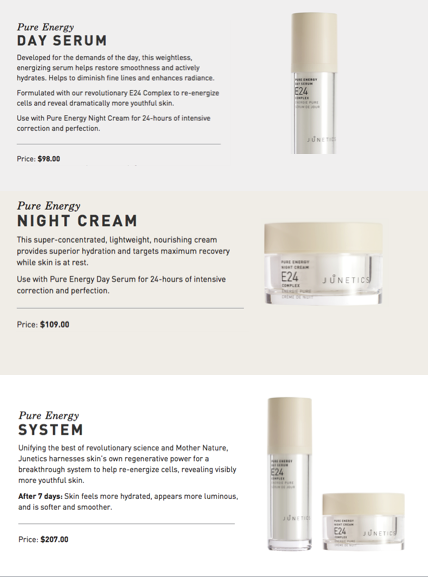 Improve skin’s clarity and overall health. Nourish and restore softness and elasticity. Hydrate and diminish fine lines and wrinkles. Provide firmer, more supple, youthful looking skin. Boost the activity of other products. Enhance the lipid layer and diminish trans-epidural water loss. GLUCO-E: A universal source of bio-energy, to reenergize skin cells, promoting cell-to-cell communication and the body’s own ability to renew skin. PLANT STEM CELLS: Regenerative and antioxidant effects that enhance natural skin renewal by providing aid to skin cells in need of repair. COPPER AND AMINO ACIDS: Strengthen skin’s protein network for visible firming and sculpting. HYALURONIC ACID AND SILICIUM: Refines skin structure while providing lasting hydration. Thank you for taking the time to read our beauty product blog post. If you have comments or questions, please add your thoughts in the discussion area below.